Looking for a project other than book work to assign his housing class, Joseph Bauer, a FACS teacher from Jefferson City High School Missouri, got a creative idea. Having already covered floor plan drawings, both top and side view designs and making scale models of bedrooms using shoe boxes, he wanted the next project to be more challenging and exciting. Combine that with the fact that it was the time in the year when Halloween was in the air and you end up with a hauntingly cool project!! 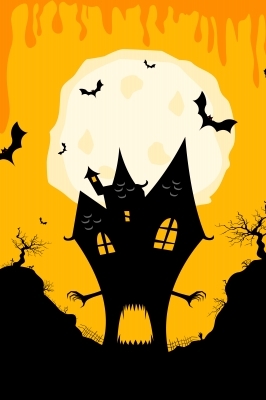 Ask students the following questions about Halloween, haunted houses and fears: How do the creators of haunted houses come up with the themes? What is the best scary movie monster and why? What is a phobia? What was your favorite Halloween costume growing up? What is your favorite scary movie and why? Close your eyes and picture things that scare you, what about these things makes you scared? Have a little fun with this one, when I hear some answers I will pull up a picture and show it to the class. And finally, Think of your biggest fear and write it on the board. After they share, tell them they will be designing and making a haunted house as their next project. Show the clip to the Monster Factory that was created by Extreme Makeover: Home Edition Season 8 to introduce this assignment. This clip also discusses some of the features within the Monster Factory. Teacher Note: Prior to this assignment make sure students know how to complete house drawings both ‘top view’ and and ‘side view’. When covering house drawings make sure to cover how to draw the elements of a house; windows, furniture, stairs, doors (all types), and flooring (since this is high school, I just had them write the flooring type). The Drawing Section: First divide students into groups of two and have them brainstorm and then design the floor plans for the entire house.After presenting their designs it to me I then had them make final copies. Rulers and straight lines had to be included for the drawing grade. To get full points they had to have a top view of each level (they had to have at least 2 levels for this project) and side views for each room (each room will have at least 4 side views, 1 per wall). Whatever students drew in the top and side views had to be in the final project and that I should be able to look at the drawings and determine everything in the finished project (i.e. I should be able to tell windows are in the correct locations, all the furniture in the drawing is present, etc.). The drawings are worth 100 points for a couple reasons, there are a lot of drawings that will be turned in and the amount of points will make the students want to put in the effort. An additional 25 points is placed onto the drawings when they turn in the completed project (they will lose points if they are missing drawings). The Building Section: Students have to build a 3-D model of their house from the ground up using any materials they see fit. It is best if they use cardboard for the floor and popsicle sticks for the walls. This is the part of the project where the students have a lot of fun and show their creativity. The model is worth 100 points. The Oral Presentation: Students had to give a presentation to the class about their haunted house and give a “tour” describing each room. This part of the project is worth 25 points. Optional: Play Halloween themed music in the background while students work.